Have you ever wanted streaming iTunes? Of course you have. The problem with it, of course is that it doesn’t exist. At least not in a way that we’d like to see it happen. Mougg is looking to change that by allowing you to stream your entire music library, wherever you happen to be. At its core, Mougg is a website. 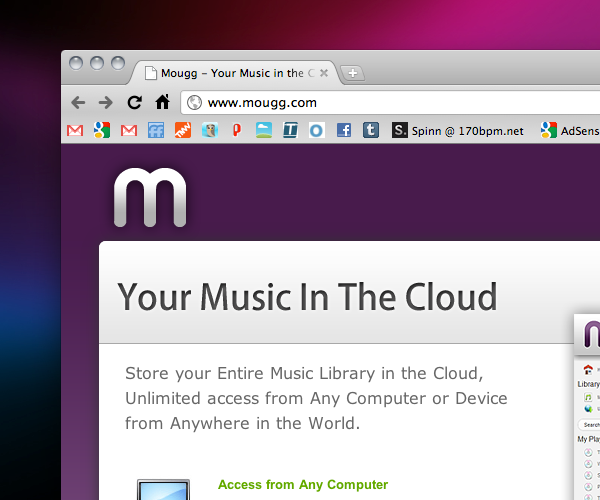 You sign up, you can upload up to 1 GB of music (mp3 or m4a) for free and then you can stream it from Mougg’s site. The beauty in this is that not only do you have access to your library via the site, you can also stream it to your Android phone via Mougg’s application. We’re told that there’s an iPhone application in the works, but it’s not finished just yet. Oh, but the site is done in HTML5, so Mobile Safari can stream things just fine. As I said in the video, there are a couple of changes that we’d like to see. First off, the upload process needs to be cleaned up somewhat. When you’re uploading an iTunes library (or any library sorted by folders), you’re only able to upload a track at a time. We’d love to see a true explorer-style uploader where we could select files from different folders. Beyond that, there doesn’t appear to be an option (even a paid one) to upload more than 1 GB of files, just yet. While it’s a pain to upload that large of a library, Mougg needs to have the option available for a couple of reasons. First, my library is massive. For a single style of music, I have 41 GB of files. I’d be willing to pay to listen to those wherever I am. Second, it’s all about revenue and file hosting isn’t cheap. Mougg needs to have income. At the moment, Mougg is the absolute best option we’ve seen for streaming your music. Even with the upload frustrations and a 1 GB limit, it’s still a very solid service, especially considering that price point of free. Comparing apples to apples, you’ll likely remember that we reviewed Audiobox.fm recently, which is a service that offers a more in-depth as well as more options for increased storage.